but I still love you! Please tell me I wasn't the only one who tried to buy it? Anyway, on to another awesome item for sale soon. I discovered this delightfully disturbing book thanks to my blogger buddy Joel's review! wow, i say wow... i want both. though i hate candy... not all candy just chocolate, well not all chocolate... grreat post today, lady! I'm not that crazy about chocolate either. 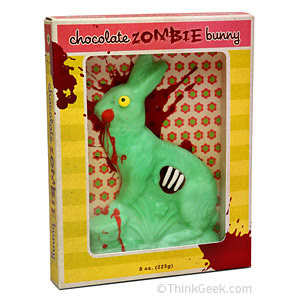 I love the zombie bunny design, but I wouldn't want to eat it! I probably wouldn't eat it either. I mean a refrigerator shelf! lol. Wonder how long it'd last. Oh - Well that's different then. :) Well, I guess it could last pretty long in the fridge, although it might taste interesting after a point...I have to wonder how it tastes in its freshest state! Have a Frighteningly Fun Bunday!